Don't see your frame listed as an option for the skin you want? There are always new frames coming out, or just frames that we haven't been able to get a hold of and make a skin template for. No problem, read below! Email us at support@stikitskins.com and let us know that your frame isn't listed. From there, we will guide you through a process to get your frame outline to us so that we can make a template for it. It will involve a little work on your end, so to compensate you for that, your first skins will be FREE as you will be the first one testing them out for us. 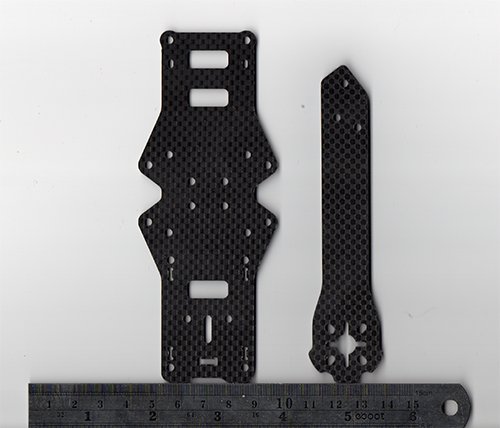 In short, you would need to disassemble part of your quad (just removing some bolts, no need to re-do any wiring) and lay the bottom plate and at least 1 arm on a photo scanner (any home use scanner should be fine) and scan a full color @ 300 dpi image of those two pieces. Include a ruler in the scan as well to verify scale. Send us that image and we'll do the rest! Below is a sample image of what the image should look like that we can use.